Grand Rapids Symphony inaugurates Neighborhood Concert Series with "Symphony on the West Side"
The natural mission of an orchestra such as the Grand Rapids Symphony is to make music. In recent times, the job of every American performing arts organization also has been to inspire, motivate, educate and nurture its audience. Today, it’s also the duty of an orchestra to connect, not only with its usual audience, but with everyone in its community. For the debut of its new Neighborhood Concert Series, the Grand Rapids Symphony did both. 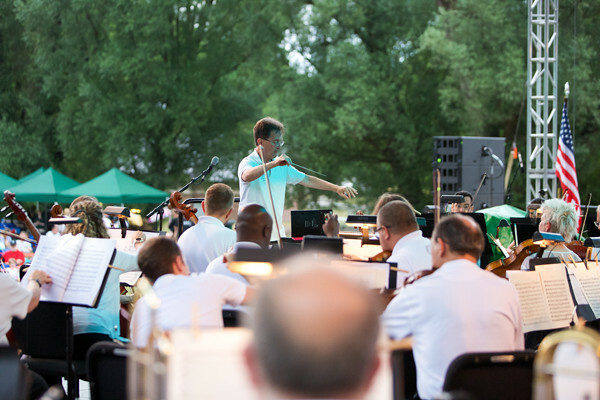 The Grand Rapids Symphony launched its brand new series with a free concert, “Symphony on the West Side,” on Saturday, July 21, in John Ball Park. Underwritten in part by the Wege Foundation, it was the Grand Rapids Symphony’s first outdoor performance in the city in 20 years. Associate Conductor John Varineau led the Grand Rapids Symphony in music including Henry Mancini’s “Pink Panther Theme,” John Williams’ theme for “Jurassic Park,” and Johann Strauss Jr.’s well known “Blue Danube Waltz” for the concert that drew music lovers from throughout the city. Huntington Bank was the Consort Sponsor, and additional support for “Symphony on the West Side” was provided by Premiere Sponsors Dykstra Excavating and Beatrice A. Idema. Music including Jose Pablo Moncayo’s spicy, “Huapango” was performed on a temporary stage for an audience that brought lawn chairs and blankets for the early evening concert. Grand Rapids’ own Edye Evans Hyde and the Terry Lower Trio joined the orchestra for popular as well as classical music. Preconcert entertainment was provided by members of Grand Rapids’ Anishinabek community of Native Americans, whose largest tribe in the greater Grand Rapids area is the Grand River Band of Ottawa Indians. Though rain forced the concert to end earlier than expected, symphony organizers called the event a big success. “Symphony on the West Side” was the first event in the new initiative launched with help from the Wege Foundation, which earlier this year awarded the Grand Rapids Symphony a $1 million grant to enhance initiatives in diversity, equity and inclusion to engage a broader audience and share live orchestral music with everyone in its community. Planning is underway to develop a series of community events that organizers hope will broaden the Grand Rapids Symphony’s audience and expose more people in the community to the power and beauty of classical music experienced live and in person.